Whippany, NJ, September 12, 2013 /PRNewswire/ — Food insecurity is a problem in America, with some low-income families having to choose, at times, between buying food essentials and paying the rent or other basic living expenses. More than 50 million Americans live in food-insecure households. This Hunger Action Month, the One A Day® Women’s Nutrition Mission — an ongoing, national charitable campaign with Feeding America — is celebrating and honoring those who make exemplary efforts to fight food insecurity and hunger in their communities. Like Jeane Larkins, who, with several local community organizations in Denver, has delivered hundreds of food “PowerSacks” – each of which can feed a family of four for an entire weekend. Larkins, a volunteer making a real difference, is one of several outstanding community volunteers today being honored by long-time hunger advocate and nine-time Grammy Award winner Sheryl Crow, Bayer HealthCare, the maker of One A Day® Women’s, and Feeding America, the nation’s leading domestic hunger-relief charity. Through the One A Day® Women’s Nutrition Mission, grants totaling $100,000 are being awarded on behalf of Larkins and three other volunteers who are making a real difference to support their local food banks in their meaningful work. To date, the One A Day® Women’s Nutrition Mission has donated four million meals** to Feeding America’s network of more than 200 food banks which helps distribute food through 61,000 food pantries, soup kitchens, and shelters in communities across America. After winning volunteer Jeane Larkins, from Denver, CO, realized the number of children going to school hungry on Monday mornings, she saw a need for change to help the one in seven food insecure households in Colorado. Starting with a delivery of 600 “PowerSacks” with enough food to feed a family of four for an entire weekend, in March 2012, Jeane has helped to grow the program significantly. In just 16 months, she has worked with Food Bank of the Rockies and local organization, Food For Thought, a project of the Arvada Sunrise Rotary Club in collaboration with Metropolitan State University of Denver, to deliver nearly 30,000 “PowerSacks” with zero overhead expenses. When Peg Molina from New Milford, CT started her Nutrition Mission working with Connecticut Food Bank’s food-assistance partner New Milford Food Bank, it was helping 30-40 households per week. Through her hard work and the development of a successful culinary training program, New Milford Food Bank now feeds more than 150 families weekly. Not only has the program had a significant impact on hunger in the community, it has allowed many unemployed participants to secure food service jobs. In 2009, Nicole Muller of Charlottesville, VA started a food drive in her neighborhood, Neighbors-4-Neighbors. Since its local inception, the program has rolled out nationally with 525,000 pounds of food and donations being made to food banks in all 50 states. The national food drive has provided meals to more than 400,000 people and has motivated many organizations to join the fight against hunger. Nicole has chosen Blue Ridge Area Food Bank as the recipient of this grant and hopes that it will have a great impact on their quest to fight hunger. Ypsilanti, MI teacher and volunteer, Tanya Mitchell, worked with Food Gatherers and staff at her local elementary school to establish The Brick Snack Pantry to help feed struggling students. The snack pantry not only provides students in need with nutritious snacks but also introduces them to new, healthy foods. Tanya hopes that the success of this program will inspire nearby schools to implement a similar program. To learn more about the Nutrition Mission, the winning entries and corresponding food banks, and how to help fight hunger locally, visit www.NutritionMission.com. Formed in 2012, Nutrition Mission is a charitable partnership between the makers of One A Day Women’s and Feeding America to support Feeding America’s efforts to provide food to millions of Americans facing food insecurity. 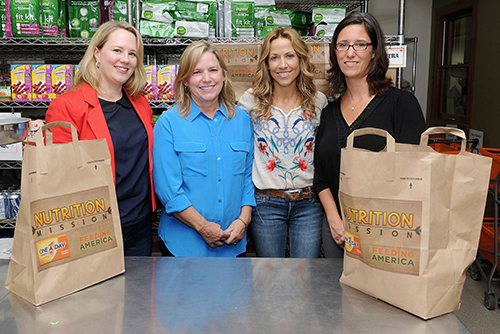 Since Nutrition Mission’s inception, the One A Day Women’s brand has donated a portion of its sales to Feeding America, which provides the equivalent of 4 million meals**. This year, an additional $100,000 in grants were awarded to four Feeding America member food banks nominated by their volunteers. Bayer Consumer Care’s line of One A Day products provides complete multivitamins with gender-specific and lifestyle benefits based on individual health concerns. One A Day Women’s is a complete multivitamin designed specifically for women. For more information about One A Day multivitamins, visit www.oneaday.com. Feeding America is a nationwide network of more than 200 food banks that leads the fight against hunger in the United States. Together, we provide food to more than 37 million people through 61,000 food pantries, soup kitchens, and shelters in communities across America. Feeding America also supports programs that improve food security among the people we serve; educates the public about the problem of hunger; and advocates for legislation that protects people from going hungry. Individuals, charities, businesses and government all have a role in ending hunger. Donate. Volunteer. Advocate. Educate. Together we can solve hunger. Visit www.FeedingAmerica.org. Find us on Facebook at www.facebook.com/FeedingAmerica or follow us on Twitter at www.twitter.com/FeedingAmerica. The Bayer Group is a global enterprise with core competencies in the fields of health care, agriculture and high-tech materials. Bayer HealthCare, a subgroup of Bayer AG with annual sales of EUR 18.6 billion (2012), is one of the world’s leading, innovative companies in the healthcare and medical products industry and is based in Leverkusen, Germany. The company combines the global activities of the Animal Health, Consumer Care, Medical Care and Pharmaceuticals divisions. Bayer HealthCare’s aim is to discover, develop, manufacture and market products that will improve human and animal health worldwide. Bayer HealthCare has a global workforce of 55,300 employees (Dec 31, 2012) and is represented in more than 100 countries. More information at www.heathcare.bayer.com. The Consumer Care division of Bayer HealthCare is headquartered in Morristown, N.J. Bayer’s Consumer Care division is among the largest marketers of over-the-counter medications and nutritional supplements in the world. Some of the most trusted and recognizable brands in the world today come from the Bayer portfolio of products. These include Bayer® Aspirin, Aleve®, Alka-Seltzer Plus®, Bactine®, RID®, Phillips’® Milk of Magnesia, Midol®, Alka-Seltzer®, One A Day® vitamins, and Flintstones™ vitamins in the United States, and, globally, Aspirin®, Flanax®/Apronax®, Talcid®, Rennie®, Canesten®, Bepanthen®, Bepanthol®, Supradyn®, Redoxon®, Berocca®, Cal-D-Vita/Elevit® and Vital 50 Plus®. Food For Thought Denver wins Small Non-Profit of the Year!